Russia's hybrid military forces attacked Ukrainian army positions in Donbas 67 times in the past 24 hours, with one Ukrainian soldier reported as killed in action (KIA) and three as wounded in action (WIA), according to the press service of the Anti-Terrorist Operation (ATO) Headquarters. In the Mariupol sector, the militants fired 120mm mortars on the fortified positions of the Ukrainian Armed Forces near the village of Bohdanivka, as well as 82mm mortars near the town of Krasnohorivka. Additionally, the enemy repeatedly opened fire from grenade launchers and small arms of various calibers on the Ukrainian fortified positions near the villages of Shyrokyne, Vodiane, Pavlopil, Chermalyk, Talakivka and Novotroyitske. 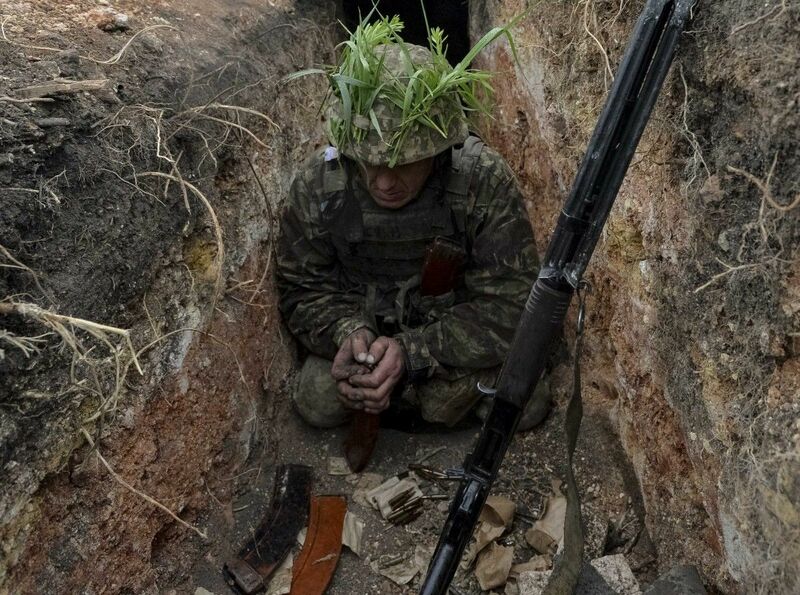 In total, 21 armed provocations were recorded in this part of the front line. The Russian occupation forces mounted 17 attacks on the Ukrainian positions in the Donetsk sector. "The Russian-backed mercenaries do not stop shelling the Ukrainian positions in the vicinity of the town of Avdiyivka. Yesterday afternoon and night, the occupiers used tank shells, mortars of various calibers and less powerful weapons against the Ukrainian defenders there," the report says. Read alsoDay in Donbas: 18 enemy attacks, 1 KIA"After dark, the invaders intensively fired from mortars, including banned ones, on our fortified positions near the villages of Verkhniotoretske, Novhorodske, Luhanske and west of the village of Troyitske. In addition, the militants used grenade launchers of various modifications near the village of Pisky in the daytime. Furthermore, an enemy sniper was active near the village of Opytne," the headquarters said. The largest number of enemy's violations of the ceasefire, namely 29 instances, was recorded in the Luhansk sector in the past day. In particular, this figure grew at night. The situation worsened on the Bakhmutka highway, where the militants actively used mortars, tank shells, grenade launchers and small arms against the Ukrainian fortified positions near the villages of Novotoshkivske and Krymske. Moreover, the illegal armed groups opened fire from mortars, infantry fighting vehicles and infantry weapons several times on the Ukrainian defenders near the village of Novo-Oleksandrivka. In addition, the militants actively used small arms and grenade launchers near the villages of Stanytsia Luhanska, Donetskiy, Troyitske, Novozvanivka and Zhovte.